With the hope for abundant harvests and happier lives, Soc Son’s Giong Festival is celebrated during 3 days from the 6th to the 8th of the first lunar month with ceremonies ranking from ‘khai quang’ (‘bathing’ the Saint’s statue) to processions and incense offerings. 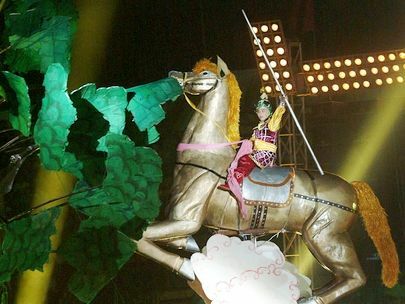 Giong Festival is annually celebrated in spring time at several parts of Hanoi Vietnam in order to commemorate Saint Giong, one of the four immortals of Vietnam travel. He is a great hero in Vietnam’s mythology, with his splendid merit in defending the country against foreign enemies.